Physical Education is an integral subject at The Macclesfield Academy, where students are challenged to stretch themselves to develop social, physical and emotional skills. These skills are nurtured through well-structured fun and engaging lessons taught by the Academy’s excellent PE staff. To gain an understanding of a wide breadth of different physical activities that can be participated in. All students in the Academy are taught twice over a two week timetable where they are introduced to a varied curriculum. The lessons are planned to give students the greatest opportunity to participate in an innovative and creative curriculum. Each lesson in PE will present opportunities to develop different skills such as coaching, leadership, officiating as well as continuing to develop physical abilities. Leadership is extremely important, not just in PE but as a life skill. The PE department recognise this and we provide students in every year a chance to help out with local primary school activities that the Academy offer to our partner primaries. In addition, all students in Year 10 complete the Sports Leader Award. All those students that help out at these various events develop skills such as organisation, timing, confidence and teamwork which help them to develop their abilities as a leader. The Sports Leader Award is a recognised qualification which allows students to demonstrate their leadership qualities. Student feedback from the leadership programme is extremely positive and we always have a high number of volunteers for each event. 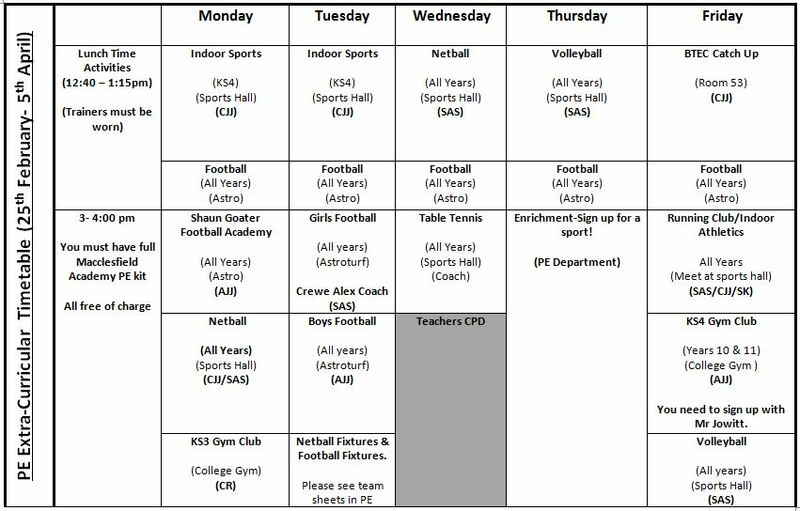 Extra curricular is a vital part of the Academy life and the PE department offer a range of activities for students to come and join in with. Extra curricular isn’t just after school either, we provide opportunities for participation before, during and after, to a range of abilities not just those wanting to reach the top of their sport. We believe sport is for all. All extra curricular provision is free to Academy students. The timetable for the period 4th June to 25th July 2018 is as follows. All abilities welcome. Association football Cannot be five-a-side or futsal. Badminton Cannot be assessed with singles badminton. Camogie Cannot be assessed with hurling. Dance Can only be used for one activity. Hockey Must be field hockey. Cannot be assessed as ice hockey or roller hockey. Hurling Cannot be assessed with camogie. Rowing Cannot be assessed with sculling, canoeing or kayaking. This can only be used for one activity. Rugby League Cannot be assessed with Rugby Union or rugby sevens. Rugby Union Can be assessed as sevens or fifteen-a-side. Cannot be assessed with Rugby League and cannot be tap rugby. Squash Cannot be assessed with singles squash. Table tennis Cannot be assessed with singles table tennis. Tennis Cannot be assessed with singles tennis. Badminton Cannot be assessed with doubles badminton. Canoeing/kayaking (slalom) Cannot be assessed in both canoeing and kayaking. Cannot be assessed with canoeing/kayaking sprint, rowing or sculling. Canoeing/kayaking (sprint) Cannot be assessed in both canoeing and kayaking. Cannot be assessed with canoeing/kayaking slalom, rowing or sculling. Cycling Track or road cycling only. Cannot be assessed in track cycling and in road cycling. Gymnastics (artistic) Floor routines and apparatus only. Rock climbing Can be indoor or outdoor climbing. Sculling Cannot be assessed with rowing, canoeing or kayaking. Cannot be assessed with snowboarding. Must not be on dry slopes. Cannot be assessed with skiing. Squash Cannot be assessed with doubles squash. Swimming Cannot be synchronised swimming. Table tennis Cannot be assessed with doubles table tennis. Tennis Cannot be assessed with doubles tennis. A number of specialist activities are included in this specification in line with the Department for Education’s (DfE) GCSE activity list for physical education. DfE and Ofqual have agreed that the awarding organisations can jointly consider additions to the permitted activities for reasons of accessibility and inclusion on a periodic basis. The use of these activities for assessment is dependent upon the student(s) in question meeting the classification requirements for the activities, as stipulated by the relevant governing body. Students without a disability cannot be assessed in these activities. Any of the listed NEA activities may be adapted to suit different needs, but the way in which they are adapted depends on the individual need or disability. It is important that any adaptation or adjustment does not compromise the rigour and validity of the assessment; often it is the context of the performance which changes, such as the use of adapted equipment or rules and regulations. In some cases, a particular move or technique required in an activity can be substituted for a suitable alternative, as appropriate.